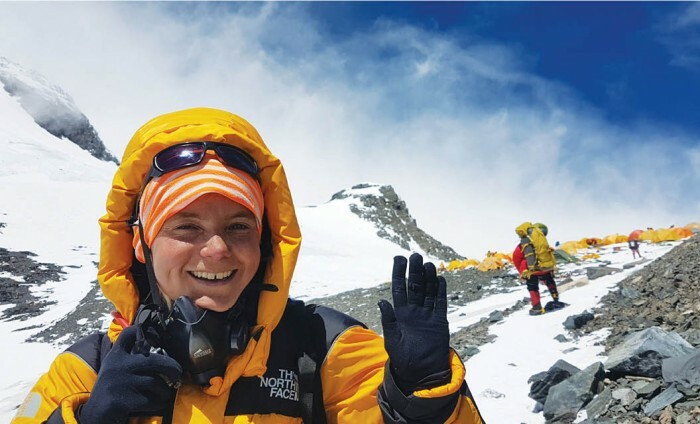 Uta, last year in May, you became the first Albanian woman to climb Mount Everest. Nine Albanians in total have been all the way up to the top. How do you feel about this? Is there still a place for emotions? First and foremost, I am proud and happy that I climbed Everest, the highest peak on earth, and that I came back safe and sane. Then, I feel even better that I am in a good physical and psychological shape, and I have continued other expeditions at 8000 m altitude. Right after two months, I climbed another height, Manaslu at 8163 m altitude. It was a very unusual expedition. Emotions are always present. It is a special kind of feeling especially that Albania’s and Kosovo’s flags were raised by a woman. Only 70 minutes later, on May 22, 2017, two citizens of Kosovo, Nazmi Hasanramaj and Arineta Mula reached the same mountain peak in Everest. Why did these two members of Everest Expedition of Kosovo choose two different agencies to climb Everest, one went with “TAGnepal Trekking” while the other with “Himalayan Traverse”? In 2015 the Team of Mount Blanc was organized in Kosovo by Albanian women who participated in this expedition. Nazmi was part of this team and its team leader, Arineta was also part of the team. During the time we planned to summit several mountain tops around the world, including that of Everest. After some time, I was informally invited to become member of the first team from Kosovo that would climb Everest. Some months later, the team announced that only men would go, while women were excluded. In that time I went to Përmet Climbing Festival and I met with Xhimi Begeja. He was looking for an Albanian woman to take on the Everest expedition. I was climbing a rock and there and then Xhimi decided that I was going with him. So, time went by, and while I trained in other expeditions in the Himalayas, Xhimi decided to take our project further, and climb Everest. We left for Everest at the end of March. Before departure, during a meeting of the Federation of Kosovo’s High Mountains and Prishtina Alpine Club, which was represented by Nazmi, a proposal was made. Both teams were to leave together. Nazmi and Prishtina Alpine Club refused this request. Xhimi Begeja also agreed on both teams leaving together. This is the reason why both groups set off and climbed together but they came back separately. Analyzing the details of the expedition from both Albanian groups, you climbed Everest peak in 15 days (7-22 May 2017), meanwhile the other group did so in 6 weeks (10 April-22 May 2017). Were you aware of the other group’s progress? Did you communicate often with them during your ascend? I left at the end of March. We used other areas in the Himalayas to acclimatize. The first part of the expedition was in Hinky Valley-Amadablam 360 steps. I helped the guide set up ropes and tents properly. I agreed to work for three weeks, with no pay, just so I could be present in the mountain and adapt to a better acclimatization. The second part of the expedition was in Makalu Region, where we joined the Swiss team and planned to reach Yaupa Peak. But, given the bad weather conditions and the incident of falling rocks we couldn’t continue any further. Until that time, we had reached the altitude of 6200 m and we were properly acclimatized. Therefore, I reached the Base Camp of Everest on May 8th and from there I started the expedition of ascending the top of Everest. I met with the team of Kosovo three times. At first we met at the Base Camp and Camp 1. Then, we went with Xhimi to visit and greet them in their camp. I met them one last time while descending from the peak of Everest. I spend 45 minutes at the peak and I met the Kosovo team while I was going down, as they were 10 or 20 minutes away from the summit. Three Albanians who weren’t united to climb the highest peak in the world, does this mean that Albanians are individualistic? No, I don’t think so and the reason is above. Climbing peaks of high altitude requires focus, good team energy, and love for each other. The individualistic character of a person might not be fit for the team, as I explained further above. But, given this example, I cannot generalize the character of Albanians. To each his own. Xhimi Begeja, who was your main support in the project “Albanian Woman in the Himalayas”, has announced that he worked to psychologically prepare you, before attempting Everest. Was the mind or the body, the biggest challenge during this experience? Xhimi Begeja was the leader of the expedition I was part of, while he constantly advised me during trainings and the ascending. I have publicly said it several times that Begeja Family has been extremely supportive overall. The mind and the body are both important. They cannot live separately. You new 5-years-project “the 14 peaks of the Himalayas” includes K2 peak, which is considered the most dangerous route in the Asian Mountain ridge. Annapurna is also considered a dangerous summit. What pushes you to take on these initiatives? There are many reasons that push me to climb the heights of the Himalayas and other peaks. First, I would like to increase tourists’ awareness over the mountains and nature of Kosovo and Albania. As a female mountaineer, I would also like to increase awareness on gender issues in our society. 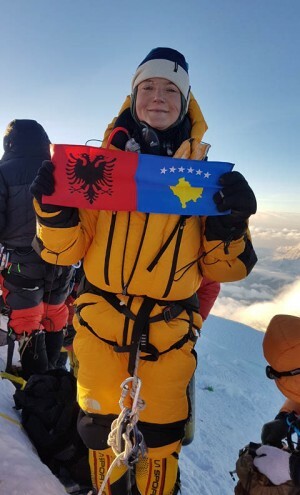 It is possible for an Albanian woman to reach the peak of Everest, the highest point in the world. I want to motivate many women and girls to climb high peaks. I want to give hope, and I want to inspire people to conquer mountain peaks despite their personal challenges. My expeditions are to be considered as achievements to both Albania and Kosovo. I will always raise both flags up. They remind me of the origin and what we can achieve. And lastly, climbing mountain peaks are a source of oxygen. The total cost of reaching K2 peak was estimated at 20,000$, and a two months time period. Looking at the prospective of the donation campaign that you started some time ago in Pristina, do you think you will have the time to gather the necessary funding for your initiative? K2 cost is more expensive than 20,000$. Companies from Pakistan offer reasonable prices, but a low guarantee. That is why their expeditions are usually unsuccessful and accident prone. I will continue to work with mountaineers from Nepal. I am looking at two ways to get financial support. One stream of income will be from direct public donations and another stream from companies, organizations and institutions. I am certain that I will achieve my goal by April 2018. I have trust in good people. Flags of Kosovo and Albania, flags of the Association Alpino-Turistike “Dajti,” personal pictures.... What will you display when reaching the K2 peak? I will have the flags of Albania and Kosovo in every expedition. Meanwhile, the flags of “Dajti” and “Pashtriku” are two high mountain associations from Kosovo and Albania, where I am a member of. I am open to raise other flags. This depends on the financial support. There are various records among those who reached the peak of Everest, starting from the 13-years-old Indian girl and ending with the 80-years-old Japanese man, as there are other mountaineers who climbed the summit 21 times. Have you thought of returning to the peak of Everest, or is it still early? No, I haven’t thought about returning to Everest, because I will spend plenty of time and energy to accomplish a 5-years-old project that will include climbing 14 peaks, over 8000 m height each. Besides the Himalayas, you have climbed other mountain peaks, including Mont Blanc, which is the highest altitude in Europe. Which of the challenges you consider the most dangerous? I have a long list of world peaks. Mount Blanc was only the beginning. There are dangers present in each of the peaks, despite the altitude or the risk. Albania and Kosovo hold high potentials in the development of alpine tourism, including rock climbing. How can you contribute to increase awareness on our country’s touristic potentials? I own the operating tour “Butterfly Outdoor Adventure” that organizes Balkan tours. During the last two years, I have developed touristic products through various projects that promoted Balkans in the world. “Via Dinarica” and “High Scardus” are some of these projects. I have showed Kosovo in some of the most famous published magazines of the world like “National Geographic”, “Lonely Planet”, “Wanderlust” and “Paste Magazine.” In 2017 with the help of my Nepalese and German friends, I led humanitarian projects that aimed at opening routes for rock climbers in Gjakova, Pristina, and Valbona. In the “The Himalayan Database” Uta Ibrahimi is recognized as an outdoor expert and expedition leader of a team made of six. Likewise, in Kosovo you lead an outdoor company and you are famous as a fashion and indoor designer, and earlier you worked in marketing. What would Uta Ibrahimi do in the distant future? During the last expedition, Manaslu 8163 m, I led a team made of six members. Even if we climb separately, I am responsible for the team members. In this case, we had regular meetings to discuss about the climbing process, reaching the summit, and the weather. I had to write reports for each member that I later submitted to the institution that gives permission. After graduating from the Faculty of Economics, with a degree in Marketing, I worked as an associated professor at the faculty. Later, I worked for private companies for three years as a Director of Marketing. My last occupation was working as a manager and then as a director, with the largest marketing agency in Kosovo, for seven years. In 2016, I took on a new challenge. Since I was spending a lot of time climbing mountains, I decided sharing this love for nature and peaks with the people. I am happy I introduced Albania and Kosovo to people abroad, likewise I am very grateful that I can inspire my own people to go closer to nature. Uta in the future will certainly work with children. Currently, I voluntarily organize daily walks for children with special needs. I will continue to spread the love while climbing with children. pavarësisë së Kosovës. Duke kërkuar mirëkuptimin e lexuesve për të mos e konsideruar realitetin si qasje seksiste, mund të konstatohet se imazhi pozitiv i Kosovës përgjatë kësaj dekade është dominuar nga gratë. Kampionet e xhudos Majlinda Kelmendi e Nora Gjakova, Mimoza Kusari-Lila si e para kryetare komune në Kosovë, por edhe Vlora Çitaku me fjalimet e saj në mbledhjet e Këshillit të Sigurimit të Kombeve të Bashkuara, vazhdojnë të kontribuojnë për vendin e tyre - secila në fushat përkatëse. Mirëpo përtej populizmit të koncertit të Rita Orës në Prishtinë e më pas edhe të Dua Lipës në Brit Awards 2018, nuk duhet harruar se sidomos me ndërkombëtarizimin e çështjes së të Mbijetuarve të Dhunës Seksuale gjatë Luftës së Kosovës (përfshi projektin “Mendoj për ty” të artistes Alketa Xhafa - Mripa), Presidentja e Republikës në vitet 2011-2016, Atifete Jahjaga - mbetet imazhi më pozitiv i Kosovës së pavarur. Ajo i mbërriti e para majat e politikës botërore dhe të gjithë të tjerët do të duhet të rendin pas gjurmëve të saj. të tjerëve u mbetet vetëm të rendin pas gjurmëve të saj. Znj. Ibrahimi! Në Maj të vitit të kaluar, ju u bëtë shqiptarja e parë që ngjiti majën e Everestit, ndërsa deri tani vetëm 9 shqiptarë e kanë arritur këtë. Si ndiheni nga ky fakt? A ka ende vend për emocion? Në rend të parë ndihem krenare dhe e lumtur që e ngjita majën më të lartë të tokës Everest, dhe u ktheva shëndosh e mirë. Së dyti, ndihem edhe më mirë që jam në gjendje të mirë fizike dhe psiqike të vazhdoj me ekspeditat e tjera në majat 8000 metërshe... Kështu, menjëherë pas 2 muajsh e ngjita edhe majën tjetër, Manaslu (8163m), gjë jo shumë e zakonshme. Emocionet vazhdojnë të jenë gjithmonë. Është ndjenjë shumë e veçantë e sidomos për faktin që flamuri i Kosovës dhe Shqipërisë është ngjitur për herë të parë nga një femër. Vetëm 70 minuta më vonë, po më 22 Maj 2017, dy kosovarë të tjerë (Nazmi Hasanramaj dhe Arineta Mula) u ngjitën në të njëjtën majë të Everestit sikurse edhe ju. Për ç'arsye pjesëtarët e Ekspeditës Kosovare të Everestit 2017 nuk u ngjitën së bashku, por zgjodhën dy agjenci të ndryshme ("TAGnepal Trekking" dhe "Himalayan Traverse")? Në vitin 2015 u organizua Ekipa e Kosovës për në Mount Blanc (Mali i Bardhë) me vajzat e para shqiptare në këtë ekspeditë. Në këtë ekip ishim bashkë me Nazmiun - lider i ekspeditës dhe Arinetën. Ideja në atë kohë ishte ngjitja e disa majave të tjera nëpër botë, përfshi edhe Everestin. Pas disa kohe, joformalisht unë u ftova të jem pjesë e ekipit së parë nga Kosova për në majën Everest, dhe pas disa muajve, nga po i njëjti ekip m'u tha se kishin vendosur të shkojnë vetëm burrat dhe nuk do të ketë vajza në këtë grup. Në këtë kohë, unë u takova me Xhimi Begenë në Festivalin e Ngjitjes në Përmet, ku ai po kërkonte një vajzë shqiptare për ta përkrahur në një ekspeditë të tillë. Unë isha duke u ngjitur në shkëmb dhe ky ishte momenti kur Xhimi e mori vendimin për të më ftuar në këtë ekspeditë. Kështu, me kalimin e kohës, me trajnime dhe ekspedita të tjera në Himalaya, Xhimi e vendosi që të vazhdojmë me këtë projekt më tutje, më saktësisht me ngjitjen në Everest. U nisa për Everest në fund të muajit Mars. Pak para nisjes, në njërin prej takimeve të Federatës Bjeshkatare të Kosovës bashkë me Klubin Alpin Prishtina – i cili përfaqësohej nga Nazmiu, u propozua që të dy ekipet të bëhemi bashkë dhe të shkojmë ashtu siç kishte hije. Kjo kërkesë u refuzua nga ana e Nazmiut dhe Klubit Alpin "Prishtina". Në të njëjtën kohë, Xhimi Begeja, lideri i ekspeditës sime ishte i mendimit që ne të bëhemi bashkë. Kështu që kjo është arsyeja se përse të dy grupet u nisëm, u ngjitëm dhe u kthyem ndaras. Duke analizuar detajet e ekspeditave të të dy grupeve ku ishin shqiptarët, rezulton se ju jeni ngjitur në majën Everest brenda 15 ditëve (7-22 Maj 2017), ndërsa grupi tjetër brenda 6 javësh (10 Prill-22 Maj 2017). A kishit dijeni për ecurinë e grupit tjetër? Sa shpesh keni kontaktuar me ta gjatë ngjitjes? Unë u nisa në fund të muajit Mars. Aklimatizimin e kam kryer nëpër zona të tjera të Himalaya-ve. Pjesa e parë e ekspeditës ishte në Hinky Valley – Amadablam 360 shkallë. Në këtë ekspeditë unë i ndihmova guidës kryesore, kryesisht me litar, hapje dhe mbyllje të tendave, etj. Unë pranova të punoj për 3 javë – pa pagesë, vetëm që të isha më shumë në male dhe të kisha mundësinë e aklimatizimit më të mirë. Faza e dytë e ekspeditës ishte në Rajonin Makalu, bashkë me ekipin e zviceranëve dhe plani ishte të ngjiteshim në Yaupa Peak. .. mirëpo për shkak të motit të keq dhe aksidentit që ndodhi (rrëzim i gurëve) nuk mundëm të vazhdonim më tej. Deri në këtë pikë ne arritëm lartësinë e 6200 metrave dhe me këtë rast ishim të aklimatizuar mirë. Kështu që në Kampin Bazë të Everestit kam arritur me 8 Maj ku edhe kam filluar ekspeditën e ngjitjes në Majën Everest. Ekipin e Kosovës e kam takuar 3 herë. Të parën herë jemi takuar në mes të Kampit Bazë dhe Kampit 1. Të dytën herë, kemi shkuar bashkë me Xhimin për vizitë në Kampin e tyre për me i përshëndetë. Dhe të tretën e të fundit herë, i kam takuar kur po zbrisja prej Majës së Everestit, ku qëndrova 45 minuta, e ata ishin duke u ngjitur, rreth 10-20 min para majës. Fakti që 3 shqiptarë nuk u bënë bashkë për të ngjitur një majë - qoftë kjo edhe më e larta në botë - a e tregon natyrën individualiste të shqiptarëve? JO - dhe përgjigjen e keni më lart. Ngjitja nëpër lartësi të mëdha kërkon fokus, energji të mirë në ekip, si dhe dashni për njëri-tjetrin. E vërtetë që natyra individualiste e një personi të caktuar mund të reflektojë në mospërshtatje të ekipit, sikurse e ceka edhe më lart. Por nuk duhet përgjithësuar kjo çështje, në bazë të këtij shembulli. Prandaj them se këto nuk janë çështje "shqiptarësh", por individësh. Xhimi Begeja, mbështetësi juaj kryesor në projektin "Femra shqiptare në Himalaya" ka deklaruar se ju ka bërë përgatitje të madhe psikologjike përpara nisjes për në Everest. Mendja apo trupi ishte sfida më e madhe në këtë ngjitje? Xhimi Begeja ishte lideri i ekspeditës time, ku gjatë gjithë kohës edhe gjatë trajnimeve dhe ngjitjes më ka këshilluar vazhdimisht. Kështu që publikisht e kam thënë disa herë, mirëpo e them prap këtu, se Familja Begeja ka qenë shumë përkrahëse në çdo aspekt. E nëse fiziku apo psiqiku, unë besoj se të dyja janë shumë të rëndësishme. Njëra pa tjetrën nuk bën. Projekti juaj i ri pesëvjeçar “14 Majat e Himalajave” përfshin edhe majën K2, cilësuar si më e rrezikshmja e vargmalit aziatik. Një tjetër majë po aq e rrezikshme vlerësohet edhe Annapurna. Çfarë ju shtyn të ndërmerrni këto nisma? Janë shumë arsye që më shtyjnë të ngjitem nëpër majat e larta të Himalaya-ve. Fillimisht, dëshiroj që nëpërmjet përvojës time të rris vetëdijen për malet dhe natyrën e Kosovës dhe të Shqipërisë te turistët nga e gjithë bota. Si alpiniste femër dua të rris vetëdijen edhe për çështjet gjinore në shoqërinë tonë. PO, është e mundshme që një femër shqiptare të ngjitet në Malin Everest, majën më të lartë të botës. Dua të motivoj sa më shumë vajza që të arrijnë të ngjiten në male dhe maja. Dua të sjell shpresë, t'i frymëzoj njerëzit për t'i pushtuar majat e tyre, pavarësisht se çfarë sfidash personale mund të kenë. Ekspeditat e mia duhet të shihen si arritje për Kosovën dhe kombin shqiptar në tërësi. Gjithmonë do t'i valoj të dy flamujt në çdo majë, që ma kujtojnë vendin tim dhe atë që mund ta arrijmë. Dhe në fund, ngjitjet nëpër majat e botës për mua janë oksigjen. Gjatë vitit të kaluar raportohet se kostoja totale e ngjitjes në majën K2 shkoi deri në 20 mijë USD, ndërsa kohëzgjatja e kësaj aventure mund të marrë deri në 2 muaj kohë. Duke parë ecurinë e fushatës së donacioneve që hapët para pak kohësh në Prishtinë, a mendoni se do t'i keni në kohën e duhur mjetet e duhura financiare për sipërmarrjen tuaj? K2 kushton më shtrenjtë se sa 20 mijë dollarë. Kompanitë nga Pakistani ofrojnë çmime të lira, mirëpo siguria në ngjitje është shumë e vogël. Prandaj shpeshherë rezultojnë me mossukses ose edhe me keq, me aksidente. Unë do të vazhdoj të bashkëpunoj me ngjitës nga Nepali. Tani po kërkoj mjete financiare nëpërmjet dy formave. Njëra formë kërkon donacione direkte nga publiku dhe tjetra nëpërmjet kompanive, organizatave dhe institucioneve. Kam shumë besim që deri në Prill 2018 do t'i siguroj këto mjete. Kam besim te njerëzit e mirë. Flamuj të Kosovës dhe të Shqipërisë, flamuj të Shoqatës Alpino-Turistike "Dajti", fotografi personale,... Çfarë do të ekspozoni në mbërritjen e K2? Flamujt e Kosovës dhe Shqipërisë janë pjesë e pandashme imja dhe ata do t'i kem me vete në secilën ekspeditë. Ndërsa flamujt e "Dajtit" dhe "Pashtrikut" - janë të dy shoqatave bjeshkatare nga Kosova e Shqipëria, anëtare e të cilave jam. Jam e hapur për flamuj të tjerë. Kjo varet prej përkrahjes financiare. Në mesin e atyre që e kanë ngjitur Everestin ka rekorde të ndryshme, që nga 13-vjeçarja indiane e deri te 80-vjeçari japonez, por edhe alpiniste që e kanë ngjitur 21 herë këtë majë. Po ju, a e keni menduar kthimin te maja Everest, apo është ende herët për këtë? Jo, nuk e kam menduar kthimin në Everest, sepse ngjitjet në 14 maja mbi 8000 metra (projekt mjaft ambicioz, i cili mendohet te realizohet në 6 vitet e ardhshme) të marrin shumë kohë dhe energji. Veç Himalajave, ju keni ngjitur disa maja të tjera, përfshi edhe Mont Blanc - më të lartën në Europë. Në cilën prej këtyre sfidave jeni ndjerë më e rrezikuar? Kam një listë të gjatë të Majave nëpër botë. Mount Blanc ishte veç fillimi. Rreziqet janë nëpër secilën majë mali, pavarësisht lartësisë apo rrezikshmërisë. Shqipëria dhe Kosova paraqesin potencial të madh për zhvillimin e turizmit malor, përfshi edhe ngjitjen në shkëmbinj. Si mund të kontribuoni ju për t'i bërë të njohura këto potenciale turistike të vendeve tona? Unë jam pronare e tour operatorit "Butterfly Outdoor Adventure" e cila merret me zhvillimin e tureve në Balkan. Përgjatë këtyre dy viteve kam zhvilluar produkte turistike nëpërmjet projekteve të ndryshme, e që e kanë pasur për qëllim promovimin e Ballkanit nëpër botë. Disa prej projekteve janë "Via Dinarica", "High Scardus" etj. Gjithashtu, nëpërmjet organizimeve të mija kam arritur të paraqes Kosovën nëpër revistat më të famshme në botë, si "National Geograpic", "Lonely Planet", "Wanderlust", "Paste Magazine" etj. Përveç kësaj, në vitin 2017 kam realizuar projekte humanitare që kishin qëllim krijimin e rrugëve të ngjitjes në gurë, në rrethinat e Gjakovës, Prishtinës dhe Valbonës, bashkë me shokët nga Nepali dhe Gjermania. Në kartelën e "The Himalayan Database", Uta Ibrahimi përcaktohet si eksperte outdoor dhe lidere e ekspeditës me 6 anëtarë. Po ashtu, në Kosovë ju drejtoni një kompani outdoor, si dhe njiheni për stilimet e veshjes dhe të banesës suaj, ndërsa më herët keni studiuar dhe punuar për marketing. Me çfarë do të merret Uta Ibrahimi në të ardhmen e largët? Në ekspeditën e fundit, Manaslu 8163, kam qenë lidere e ekipit me 6 anëtarë të tjerë. Kjo nënkupton që edhe pse ngjitjet i bëjmë të ndara, unë kam përgjegjësi për atë ekip. Me këtë rast, kemi pasur takime të kohëpaskohëshme për diskutimin e procesit të ngjitjes, planeve për majën, motin etj. dhe në fund mua më është dashur të raportoj për secilin anëtar në institucionin ku jepen lejet. Pas përfundimit të Fakultetit Ekonimik, dega Marketing, për dy vjet isha asistente e lëndës së Marketingut në Fakultetin Ekonomik, e më pastaj kam vazhduar 3 vite të tjera nëpër kompani private, si Drejtore Marketingu, si dhe punën e fundit, në agjencionin më të madh të marketingut në Kosovë, fillimisht si menaxhere e pastaj si drejtore, për 7 vite. Vitin 2016 e fillova me një sfidë të re. Meqenëse po kaloja shumë kohë nëpër male, vendosa që këtë dashni për malet dhe aktivitetet në natyrë, ta ndaja me njerëzit. Jam e lumtur që arrita t'ua prezantoj vendin tim njerëzve jashtë Kosovës e Shqiperisë, e gjithashtu jam shumë e lumtur që edhe popullin tim arrij ta frymëzoj që të jetë më afër me natyrën. Uta në të ardhmen: sigurisht, puna me fëmijë. Për momentin, një herë në muaj organizoj ecje ditore me fëmijë me nevoja të veçanta dhe këtë e bëj në baza vullnetare. Do të vazhdoj ta shpërndaj këtë dashni për ngjitjen me fëmijët.